sewing tips | Sew Giddy!! Sew Great to Read About It!! 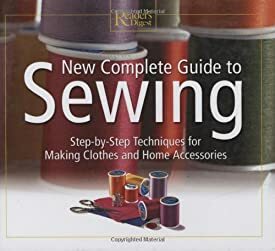 If you are like me and have a desire to broaden your sewing knowledge as well as try your hand at new projects all the time, you may want to invest in a good book! I have found a lot of helpful information on the internet by following sewing blogs (both novice and expert) and learning about different techniques I can apply to my projects. While free information on the internet is fun and a wonderful resource for learning, I also found the book New Complete Guide to Sewing by Reader’s Digest to be an abundance of information! Not only does it explain the basics of what is needed to get started as a newbie to the sewing world, but it also has illustrations and step-by-step techniques for home projects and for making clothes! My friend who is a pro (nearly 60 years of experience!) at sewing everything from clothes and stuffed animals, to everything in between, was so impressed with this book she purchased one for herself after reading mine! 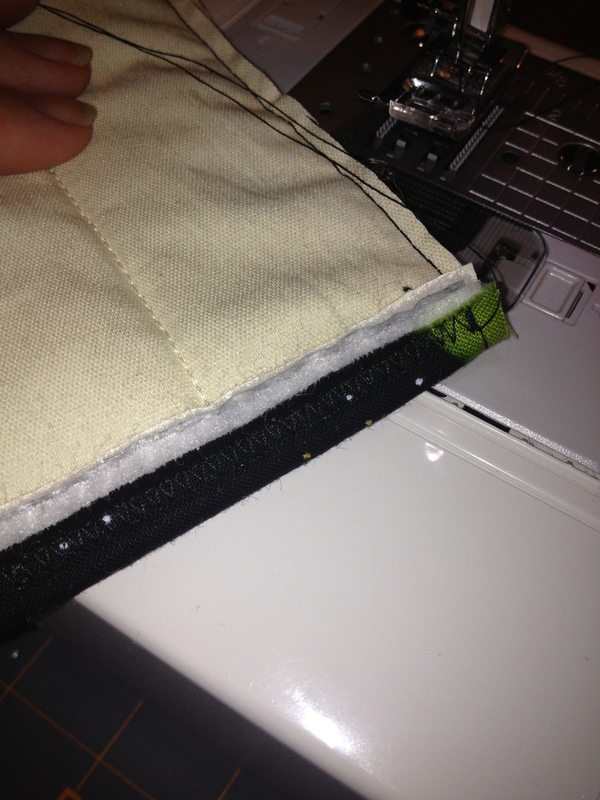 I know there are a ton of good sewing books and guides out there. This one seems to cover it all in a user-friendly, easy-to-follow way, and because of that – I thought I would share the news! 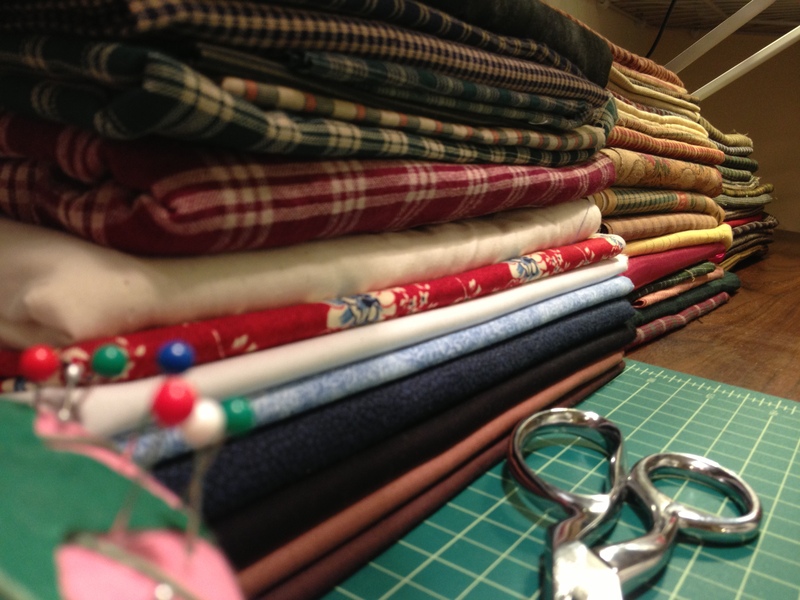 Do you have a favorite sewing guide? 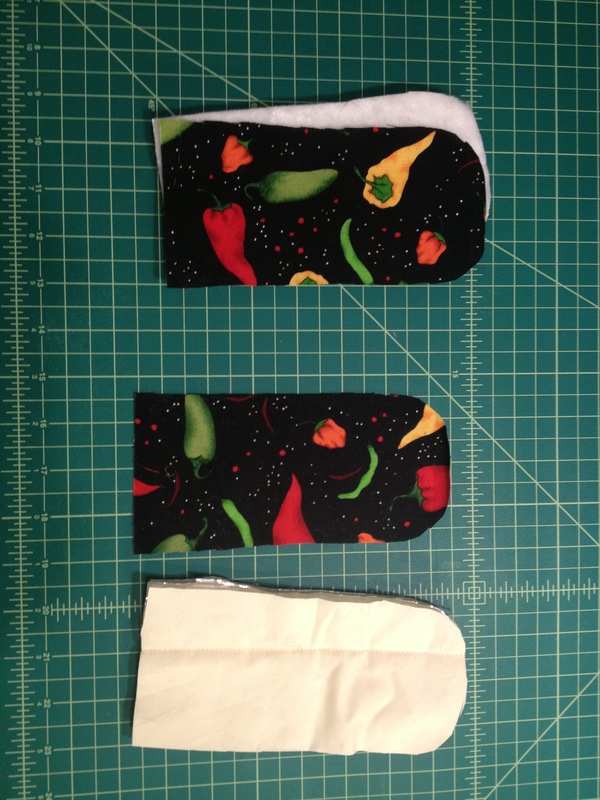 Although I love cooking, I can sometimes be a bit clumsy in the kitchen…which is what inspired me to create this Hot Handle Pot Sleeve! 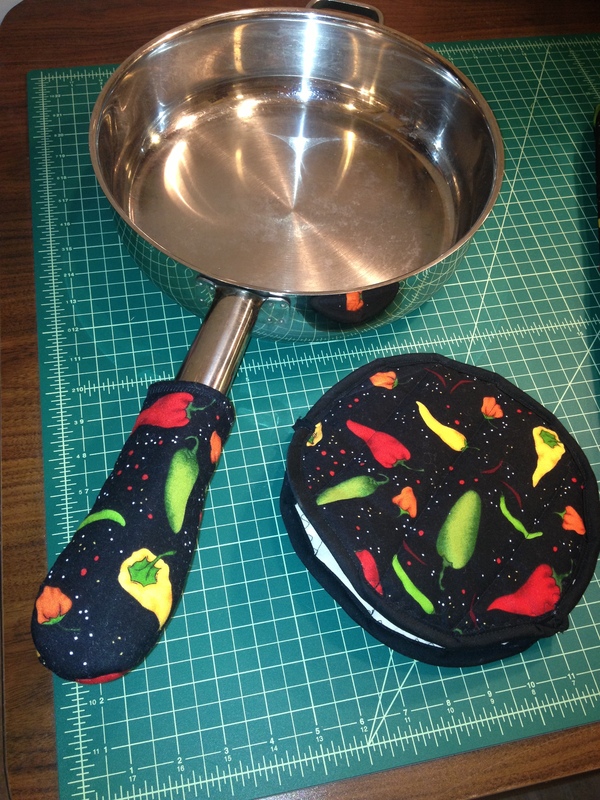 Easy to make and it matches the tortilla cozy I made last year! First I measured the handles on my pots and pans for which I will be using the “sleeve” for, so it will fit on all of them. I made a dome-like pattern that measured 3.5″x7.5″. Then, using that pattern I cut out 2 pieces of fabric and 2 pieces of Insul-Bright and sandwiched them together so the fabric connected to the Insul-Bright was facing down and the wrong-side of the patterned fabric was against the batting of the Insul-Bright. 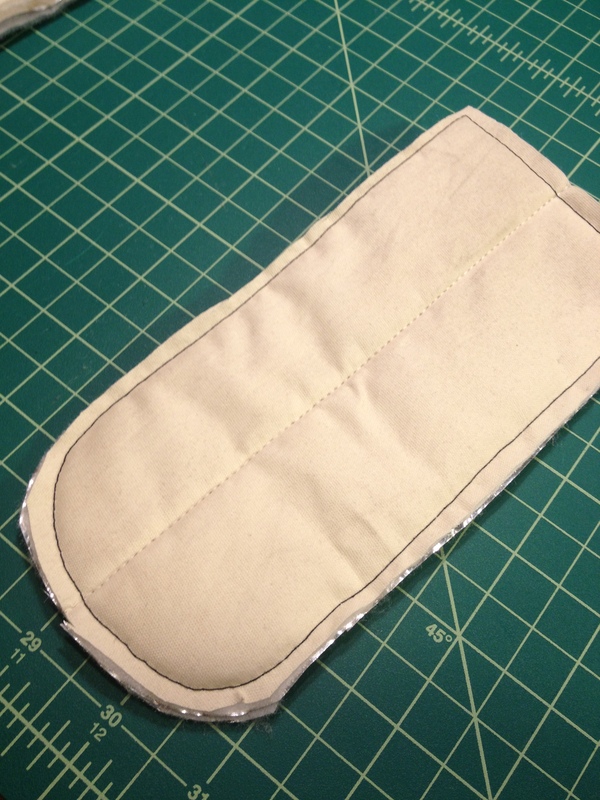 I then basted around the edges to keep the fabric and the Insul-Bright together. Now take both finished pieces and place the patterned fabric sides together and zig-zag stitch around the edges, careful not to sew the short, straight side which will be the opening. Trim the edges so they are even, then turn inside out. 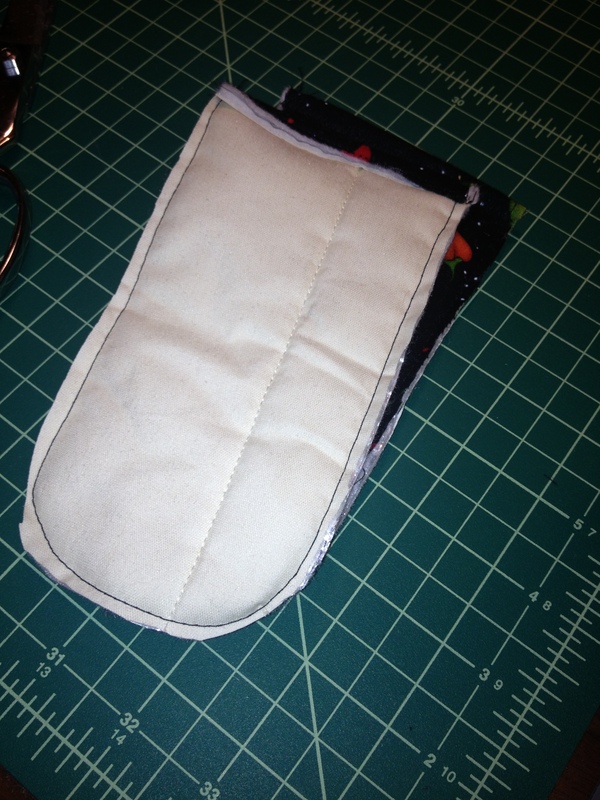 Sew Easy, even a novice like me can do it!! Ever wonder what a “reverse applique” is? 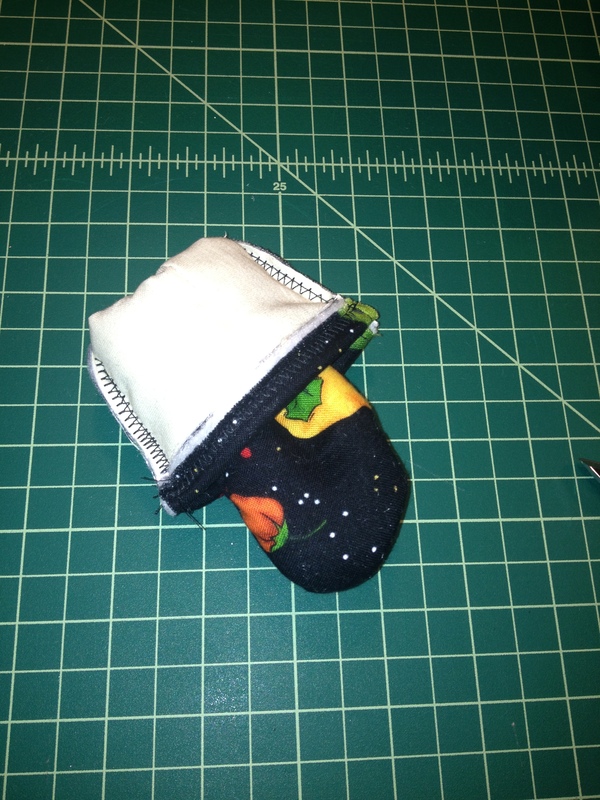 Well, I had no idea but found it to be a simple technique to show depth in a sewing project. Reverse applique can be used on various projects, such as adding dimension to pillow designs, quilts, purses, etc.. In my case, I will be using a reverse applique on a quilt intended as a wall display. Reverse applique is accomplished by pinning two fabrics together, drawing the pattern to be cut on the top fabric and sewing around (by hand or machine) the pattern. Then, with sharp scissors, cut along the pattern lines for top fabric only. The bottom fabric shows through and is framed by the upper fabric. I have seen reverse applique done in multiple layers too, just be aware that the project can become quite thick if too many layers are added to the project. I will share an example once I have my project started! Do you have one you would like to share?